Dogs' love of play and innate curiosity makes them prone to scrapes and injuries from time to time. And even the most well-behaved dog can end up with an eye injury. This can happen from rough play, chasing small animals through the underbrush, or just digging in the garden. As a dog owner, familiarizing yourself with the different types of eye injuries helps you better respond to one when or if the issue presents itself. Often the result of blunt trauma, eye injuries are conditions that usually require immediate veterinary care. Some eye injuries are considered emergencies, especially if the loss of vision is a threat. Eye injuries range from mild to severe and can generally be diagnosed by your vet with some simple tests. Common eye injuries include corneal laceration (cut or scratch to the eye surface), corneal ulcer (from chemicals, debris, or rubbing), puncture wound (from any foreign object), eyelid trauma, or proptosis (when the eye pops out of its socket). Many different eye diseases can affect dogs. Ocular symptoms can arise even without an injury. However, if your dog's eye has a noticeable wound on or around it, perhaps accompanied by blood, it's best you get it checked out. Other symptoms of eye injuries include squinting, twitching or spasming of the eyelid, pawing at the eye area, blinking rapidly, or excessive tearing. Some injuries may even affect your dog's ability to open its eye entirely. A bloodshot appearance in the white of the eye may indicate trauma or irritation. A yellow or greenish discharge can signal an infection. Other types of eye problems can result in redness of the mucosal membrane surrounding the eye, cloudiness in the eyes, prolonged pupil dilation, asymmetrical appearance of the eyes, and light sensitivity. Signs may be present in one or both eyes, which can sometimes confirm if it's an injury or another issue. If you notice your dog experiencing any of these symptoms, seek veterinary attention as soon as possible. Do not attempt home care for eye problems unless advised to do so by a professional. Since eye problems can be much worse than they look—and can progress very rapidly—don't risk your dog's vision or tolerance for pain. An eye injury occurs when something comes into contact with your dog's eye and causes damage. A dogfight or altercation with another animal, a cat's claw swipe, or a kick from a horse can all easily injure a dog's eye. Many natural hazards also cause injuries to the eye. Tree branches, insect bites, and dirt scratches can damage or irritate the outer portion of the eye. Dogs that hang their heads out of the car window are at risk for debris blowing into their eyes, causing irritation. Chemicals sprayed or spilled near your dog can cause a temporary sensitivity in the eyes. Sharp objects like furniture corners, fence parts, fishhooks, and tools can also pose a threat to the delicate tissue of the eyes and the surrounding area. Itchy eyes due to allergies or a mild irritation can lead to eye injuries if your dog is pawing at the eyes or rubbing on something. If this behavior continues, an ulcer or scratch can form on the cornea. If your dog has an eye injury, call your veterinarian. Do not attempt to treat it at home without speaking first to the vet's office. If instructed to administer first aid, a vet may suggest flushing out the eye or applying a cool compress. Upon recommendation, use a sterile saline eyewash solution to flush out your dog's eye. Do not use contact lens solution. Remember to be gentle! It is likely your dog is experiencing some degree of pain. Enlist another family member to help you hold your dog while you carefully attend to the eye. A bathroom floor, tub, kitchen floor, or patio can work well. Choose an area that provides you with easy access to your pet and can take a wet spill. Place smaller dogs up on a table, a counter, or even the sink to aid the ease of cleaning. Wrap a towel around the dog, hold the dog's eye open with one hand, and apply a stream of eye wash with the other. Use a small towel or cloth to catch the saline streaming out of the eye. After that, take your dog to the vet. The vet will ask the details of the injury, followed by an examination with several eye tests to assess tear production, look for ulcers or lacerations, and measure the intraocular pressure of the eye. Depending on the diagnosis, a simple treatment of eye medication and a follow-up exam may be recommended. However, severe injuries may require a referral to a veterinary ophthalmologist for surgical treatment. In severe cases, surgical extraction of the eye (enucleation) may need to be performed. However, your vet will do everything possible to save the eye. Do note, however, that some injuries may cause permanent blindness. If your dog is sent home with eye medication, apply it exactly as prescribed. If more than one eye medication is prescribed, put drops in before applying ointments. Be sure to wait about five minutes between each eye medication. Most dogs with eye injuries will also need to wear an E-collar (the infamous cone) to prevent from pawing or rubbing at the eye. The collar will also help protect the eye from hazards around the home. The E-collar should be worn at all times unless your vet gives you exceptions. Do not skip or postpone follow-up visits. Eye problems require close monitoring and can deteriorate without you realizing it. 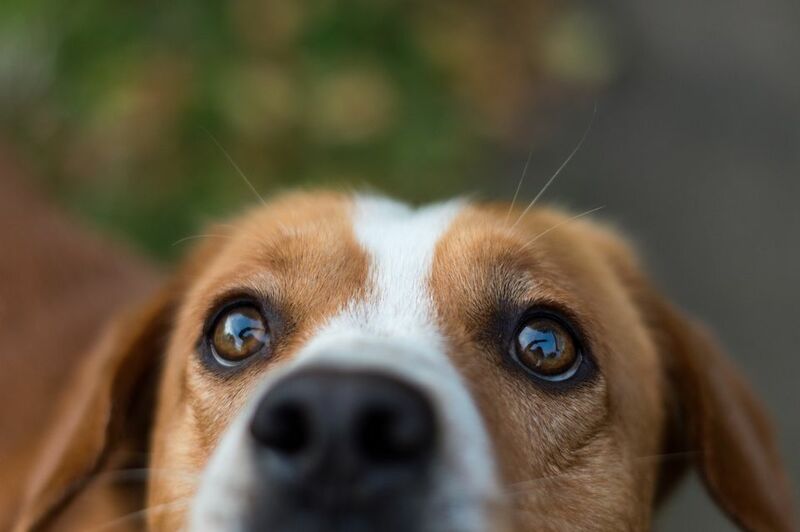 If your dog's eye looks worse and it's not yet time for a checkup, call your vet right away rather than waiting. Accidents happen, but keeping your dog safe and preventing injury resides in your hands. Socialize your dog and take measures to prevent dog fights to avoid costly medical bills down the road. Teach your cat and dog to get along to reduce the chance of a claw swipe. Watch your dog outdoors, especially in areas with lots of underbrush. Don't allow your dog to roam free. It's also best to teach your dog not to hang its head out of the car window while you're driving (even though it's fun). Always keep dangerous chemicals out of reach.